It's taken Mortal Kombat X to show me how much I've changed since 1992. See, back then I was in love with a new arcade game they'd just installed in the cinema at Sheffield's Meadowhall shopping centre (this was before the proper arcade was even built). It looked like real life, it sounded incredible in that small, sweaty room and - best of all - it was stupendously violent. I would go out of my way to play Mortal Kombat as much as possible; I learned all of the fatalities and revelled in their gory glory. I studied all of the lore - I even wrote my own, inventing new situations for existing characters and new characters for existing situations. I genuinely adored everything Mortal Kombat did - I got giddy with anticipation when Mortal Kombat II finally came to the Amiga, and one of our first purchases on the SNES was that very game (seeing as it had blood this time around, unlike the first SNES version). Christ, I even liked the film. My dad bought it for my brother and I from Tenerife from some dodgy bloke, and even though you could barely see anything on the pirated VHS, I still watched it to death. What I'm saying is, Mortal Monday meant something to me. But Mortal Kombat X showed me... it's not my game anymore. Dare I say this? It's... I don't like the violence. Cassie Cage's X-Ray move, where she thwacks the groin of an opponent with a volleyball dig and you see two testicles explode, is funny. It is. It made me cringe, it made others gasp aloud, but it's funny. But the rest just don't appeal like they used to. Maybe I'm old, maybe it's the graphical fidelity that puts me off - there's a distinction between the blocky, pixellated, B-movie style spinal cords ripped out of the original Mortal Kombat and seeing someone's internal organs slapped in front of the camera in vivid detail. Developer Netherrealm's Brian Goodman doesn't think that it goes too far (and neither do I, even though it doesn't appeal to me like it once did): "It's not really a question of too far," he said, "It's more a question of what's right for the game... really it's about finding the right tone and the right feel for the game. We want our fatalities to be really impactful, but we want them to be entertaining - we want them to be something people enjoy, that feels like a real payoff." They definitely feel like a payoff. But something I enjoy, like a perfectly-executed killing spree in Hotline Miami? No chance. Mortal Kombat X plays better than 2011's reboot of the series, with combos flowing a lot smoother and clear work put into making it a balanced, accessible - but deep - brawler. The addition of three fighting styles for each character might seem like a retroactive step - we had them all the way back in Deadly Alliance, after all - but they're much more useful this time around. Rather than just being a different stance, weapon or a few special moves, it actually ties in to making your character play how you want them to. For example, you could have Sub Zero playing as a defensive, ice-trap-laying vagabond, or use Ferra/Torr as the brutal tank he should be (with Ferra standing on the sidelines). It opens up the game to actual strategic play, and will definitely be an interesting concept to toy around with. And, from what I played, it's not just a gimmick - Mortal Kombat X aims itself at the pro fighting game community, offering details like frame rate data in move lists and - though I didn't see it running - an expanded training mode. Obviously this is still a mass market game at heart, as MK always has been - there's appeal for the button-mashers out there, and the much-lauded story mode from 2011's reboot returns... though with a new story, of course, set some 25 years following the events of the time-travelling reboot. The challenge tower from last time around has evolved into Living Towers - a series of fights that add modifiers and challenges in a dynamic fashion. One second you're brawling with bombs being dropped on you, the next there's a chance of freezing your opponent while blocking. It's a fun little mode, and as it will be changing constantly - there are hourly, daily and weekly towers to tackle - there's always going to be something new to hone your skills on in this single-player mode. Another single-player mode with online leanings is the Faction War online meta-game, which offers a 'platform agnostic' experience where many things you do in the normal game contribute to your score. "It's a connected experience," Goodman explained, "Where players are asked to choose between five factions based on the Mortal Kombat lore. Once you've chosen your faction, many of the things you do are going to add points to your overall faction war total - just by playing the game. Every week we're going to crown a winner, and the highest-scoring faction will be given rewards for the entire faction." 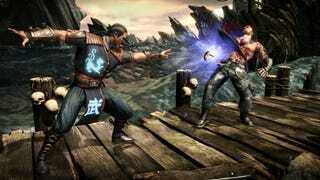 It all points towards a studio doubling down on what made the 2011 reboot of Mortal Kombat so well-received: a focus on tight mechanics, more reasons to come back and play more (aside from online, competitive modes) and a return to the still-unique-for-a-fighting-game involved story mode. And that all sounds good. And all plays well. And is sure to be received positively by the community hankering for some more freezing, chain-to-the-necking, testicle-punching brawling action. It'll make a lot of people laugh too, which is entirely the point. This time around, though, I'm just not getting the joke. It's taken two decades, but I think I've outgrown Mortal Kombat.